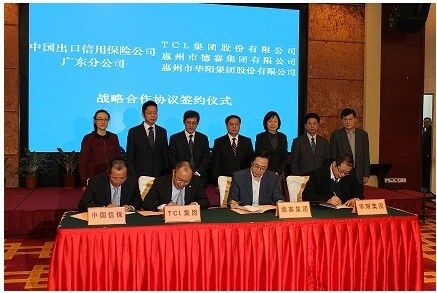 In Jan. 2014, Foryou and SINOSURE (China Export & Credit Insurance Corporation) signed "The Comprehensive Strategic Cooperation Agreement" in Huizhou, based on the 9-year cooperation before, which represents that Foryou will promote its international operations in a more stable manner with the support of SINOSURE, a key policy-oriented Chinese insurance company. And SINOSURE would help Foryou and its subsidiaries to develop international business, with Foryou Medical Electronics Co., Ltd. included. In accordance with the agreement, SINOSURE shall focus on supporting Foryou's export business expansion, providing Foryou with short, medium, & long-term export credit insurance, as well as other insurance products. It will also offer Foryou full services including credit management, guarantee and financing facilities, supporting its goods and service export. During the recent years, Foryou has been implementing the international strategy and keeping expanding international business. And the products of Foryou Medical Electronics Co., Ltd. have been exported to over 20 countries in Europe, North America, Latin America, Asia, Africa, and Oceania. The cooperation between SINOSURE and Foryou also fully embodies that export credit insurance, as a policy-oriented tool, is playing an increasingly important and unique role for enterprises in taking precautions against international trade risks, stabilizing external demands, expanding overseas markets, improving risk management and ensuring the stability of enterprise operation. SINOSURE is a state-funded policy-oriented insurance company with independent status of legal person, established for promoting China's foreign trade and economic cooperation. It began operations on December 18, 2001. Presently SINOSURE has formed a nationwide service network. Its business guideline is as below: by means of insurance service for foreign trade and investment, fully supporting the development of foreign trade and economic cooperation and promoting the economic growth, the employment and the equilibrium of international balance of payment. SINOSURE is mandated, in accordance with the Chinese government's diplomatic, international trade, industrial, fiscal and financial policies, to promote Chinese exports of goods, technologies and service, especially high-tech and high value-added capital goods like electromechanical products, and national enterprises' overseas investment, by means of export credit insurance against non-payment risks.